OLD PARKED CARS. 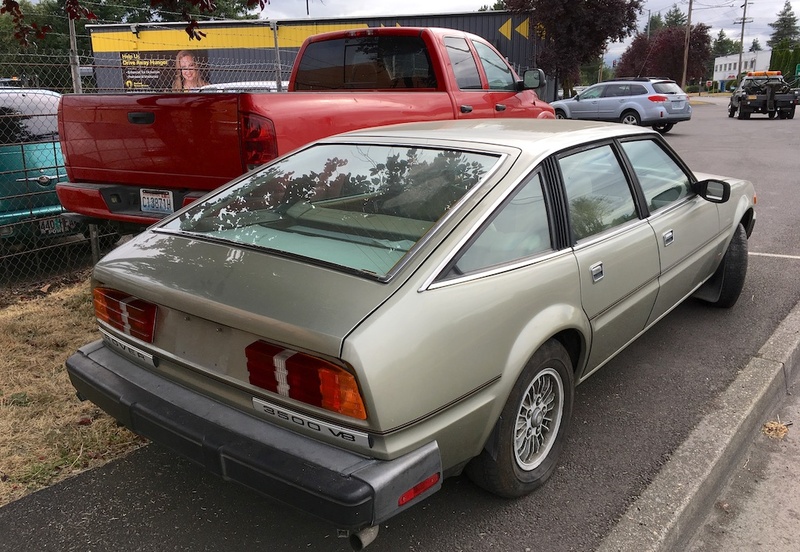 : 1980 Rover SD1 3500.
elements of NUMMI Corolla, A40 Celica, Ferrari 365 GTB/4 in there. 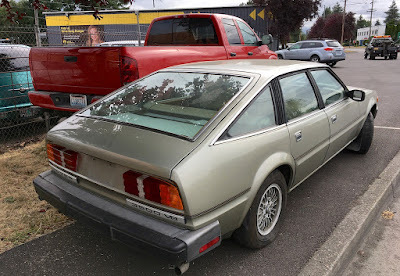 Excellent alloy design, those HUGE badges on the rear must be an attempt to keep people from asking "What the heck is that?" in every parking lot. Love the tiny Union Jacks on the fenders. Hate the giant American safety reg buggy pushers. Wow, how did that get there! What a horrible car. Looks like it was designed in sections by two or three different blokes, and only the guy on the rear kept his mind on the job / wasn't smashed. The front end looks so miserable. bonus feature: tell car burglars h thieves "move along, nothing to see here"
I KNEW one of you guys would find one of these eventually! a sure sign that your car is a good one: when it's found this at a donate-your-wreck-to-charity lot. there's another one of these in town. 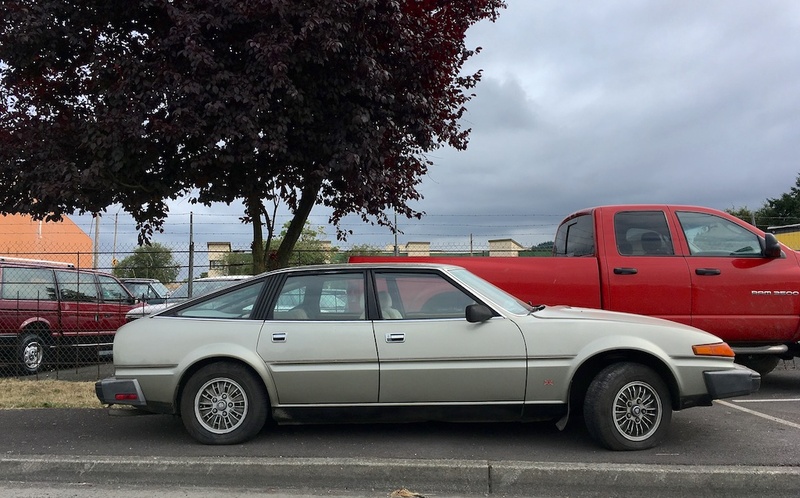 i've seen it driving twice, plus offered for sale on ebay. thought this was it, but it's not. so keep your eyes peeled. This is unbelievable. And does it remind anyone of Jeremy Clarkson's "Full Throttle" video? @18:17 http://putlockertv.ist/watch/oxQ6Q8Gn-jeremy-clarkson-at-full-throttle.html and again at 44:39. These are SUPER rare! Less than 800 were made in 1980, they sold 400 that year, then a couple hundred more of the leftovers in 1981. The rest got modified to RHD (very easy to switch over on this car) and sent to Australia! What mess the British car industry was in at this time. Can't see one of these without the Human League "Don't You Want Me" song playing in my head. I really appreciated them thinking outside the box AMG wheels for sale on every single occasion I have called them since; they have had superb customer service. They are just good quality people. They went above and beyond on each and every occasion since their original conversation with me. I would recommend them to anybody….. Your way to enlighten everything on this blog is actually pleasant, everyone manage to efficiently be familiar with it, Thanks a great deal gym pros. 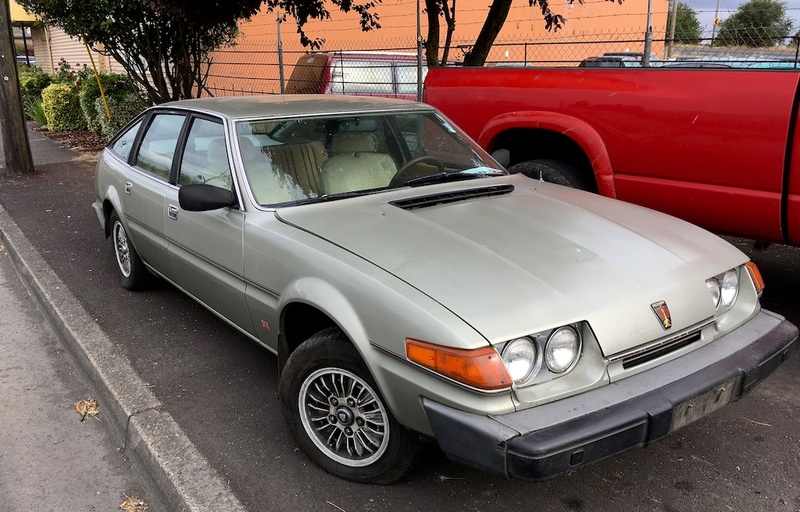 Judging by how high this SD1 is at the front, its V8 may have already been stolen by someone doing an MGB-V8 conversion. Sad fate that would be. Hope it's not the case. These were very popular in the UK back in the day. Crazy to see one in the USA in such good condition. I don't think there's even many left in the UK in good condition. Great find!